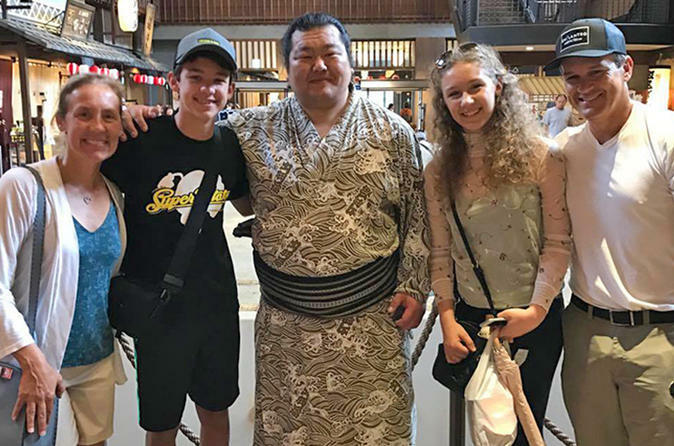 Discover an important part of Japanese culture during this 2.5-hoursmall group walking tour through Tokyo’s Asakusa and Ryogoku districts with a sumo wrestler. Learn about how the sport works and see some of the most significant sumo sites in Tokyo with a friendly former wrestler as a guide. Visit a famous sumo wrestling stadium, shop for supplies at an outfitter store and grab delicious snacks along Nakamise Street. Don’t miss this unique opportunity to uncover an important part of Japanese life. This tour is limited to eight people for a small-group experience. This unique 2.5-hour small-group sumo experience offers the perfect opportunity to dive into Japan’s important sumo wrestling culture. A former wrestler will act as your guide for the day and usher you around some of the most important places for sumo wrestling in the area, including the stadium where matches are held, Ryogoku kokugikan, as well as a sumo supply shop. The stadium is located in Tokyo’s Ryogoku district, a sumo wrestling hot spot, where it’s not uncommon to see wrestlers walking around wearing the traditional ‘yukata’ uniform. Meet, chat and watch the athletes during your visit and learn how the sport works from your friendly guide. Depending on the time of year, you may even get to watch a sumo tournament underway (tournaments are held in January, May and September). In addition to visiting Ryogoku, your tour also includes a stop at Asakusa, one of the oldest neighborhoods in Tokyo. Part of the ‘shitamachi,’ or ‘low city,’ Asakusa offers the chance to visit a 7th-century temple, Sensoji. Shop for snacks and souvenirs on Nakamise Street, which leads to the temple’s entrance. By the end of your tour, you’ll be an expert in sumo culture.